It’s not a fish bowl. It used to be, but it’s not any more. 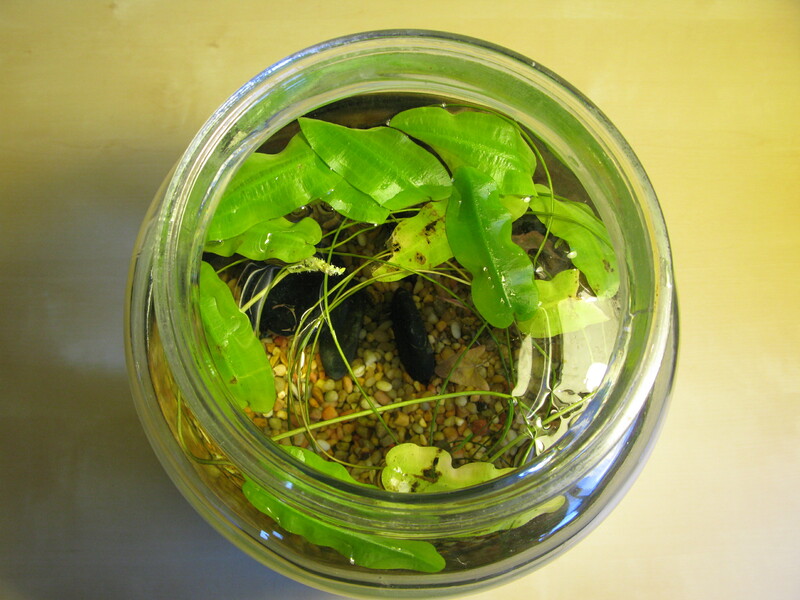 I started this project years ago because I wanted to grow some aquatic plants indoors. I thought I would have to have a fish for this to work but having a fish in a bowl without a filter and heater is more work and heart break than I need. I tried for years. And 3 betas later, I’ve found the system works better without the fish. It’s a 2 gallon glass flour jar filled with water with aquarium rocks in the bottom. In the rocks, I’ve got some fish tank bulbs. Then I’ve got some black river rocks for some added interest. 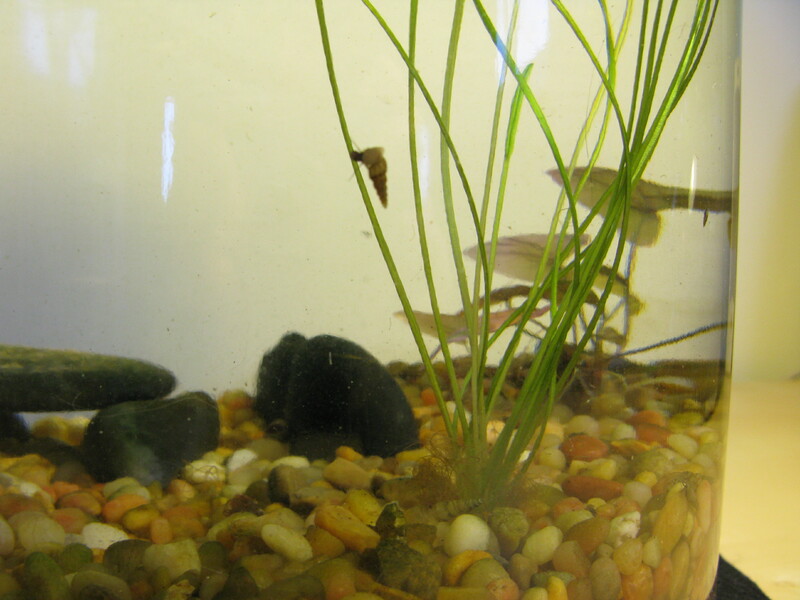 A bunch of trumpet snails live in the bowl and they are the key to making this work. They keep the glass clean and eat any dead plant leaves if I don’t get to them quickly enough. They don’t eat live vegetation. And because they feed themselves, you don’t need to feed them ever. You should feed them if you’re just getting started and there’s nothing for them to eat yet though. They like dead vegetation and fish food if you need to supplement. Having plants that live at different levels is nice, but in my pond it was a complete stroke of luck since I used aquarium bulbs and you just get what you get from those packs. I’ve got one that has leaves that float on the top and another with pink-ish leaves that stays pretty low. The top-floating one flowers regularly, which was a complete surprise to me. Also, our cats think this is a better place to get water than anywhere else, so we are constantly adding water. To maintain the pond, take out any excess dead plants. My snails come out at night, so to avoid throwing out snails, I have to pick leaves during the day. 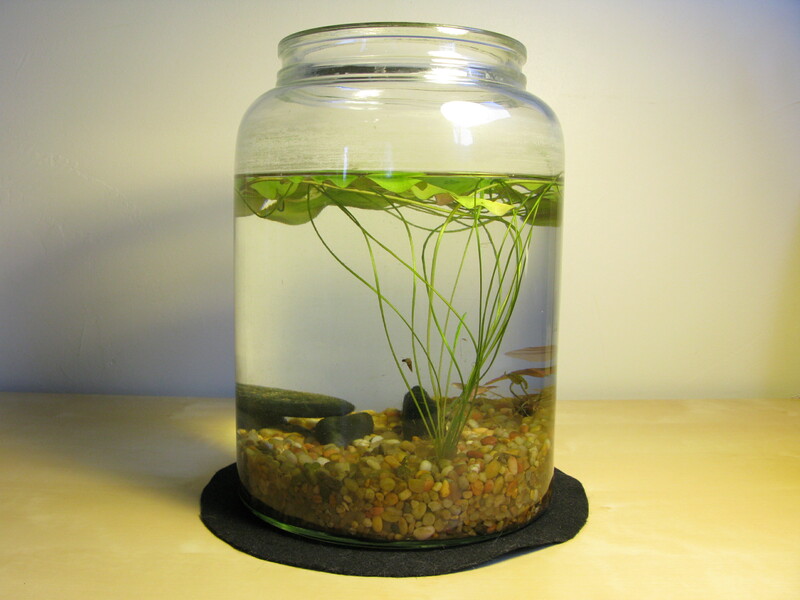 Also, a partial water change every couple of weeks is a good idea too. 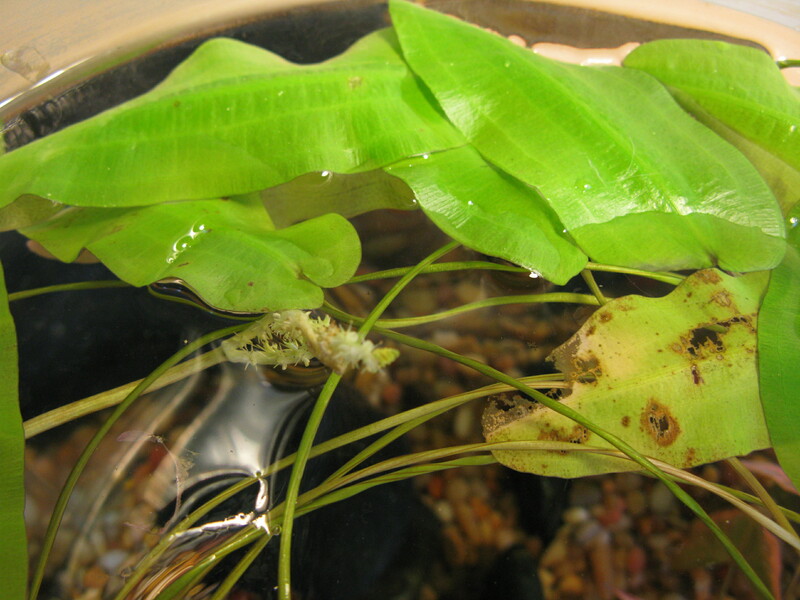 UPDATE: There’s more about critters for your indoor pond like snails and shrimp, AND baby shrimp hatchlings on this blog. Snails can be very entertaining (yes, I know that sounds strange). Also, learn a nifty trick for cleaning your pond. This entry was posted on Wednesday, January 11th, 2012 at 12:00 pm	and tagged with DIY, Gardening, Plants, Science and posted in DIY, Gardening, Indoor Pond, Plants, Science. You can follow any responses to this entry through the RSS 2.0 feed.